Local communities have always found the South Form of the Flambeau River important. This waterway provides us a gateway to the Chippewa and Mississippi Rivers, as well as offering homes for many animals and plants. The people of Northern Wisconsin have been inspired by and depended [sic] on the river for travel, food and fun. The river has served as a roadway connecting us to other communities downstream. 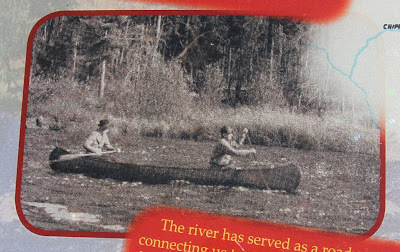 In the past, the travelers were Native Americans and fur traders; today most are recreational canoeists and kayakers. If you had a canoe or kayak you could enjoy a number of rapids that sprinkle [sic] the river, adding excitement to the beautiful scenery. Lumbermen rafted logs down the river during the lumber days that peaked in the 1880s. The timber was brought in this manner from the lumber camps to the sawmills and [sic] eventually used to build homes. One such mill operated in Fifield until 1961. The logging industry shaped the local community. Visitors to Movrich Park have enjoyed the fishing opportunity [sic[ along the river's banks. 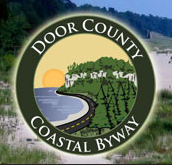 You might catch muskellunge, sturgeon, walleye, trout, bass or panfish. Transcribed as written, without correcting errors in vocabulary and syntax. With the Flambeau River visible in the distance . . .